In 2015, CRS and our partners embarked on an ambitious strategy to create a sea change in how water resources are managed in five of Kenya’s arid or semi-arid counties, which account for more than 80% of the country’s land area. The $35.5 million program, funded by USAID and the Swiss Agency for Development and Cooperation, harnesses the energies of about a dozen nongovernmental and private-sector partners to help strengthen the capacity of five county governments. 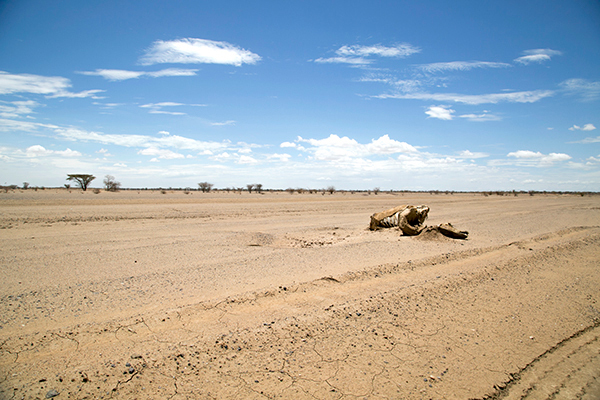 The importance of water in these increasingly parched zones cannot be overstated. In recent months, violent clashes have erupted between different tribes and private landowners in central and northern Kenya, as pastoralists invade property in search of scant pasture for their huge herds of livestock. There have been shootings and killings, and a number of tourist lodges have been torched. Currently, 2.7 million Kenyans need food aid to cope until the next major harvest. And since there has been little rain, that number is expected to climb to 3.5 million by August. 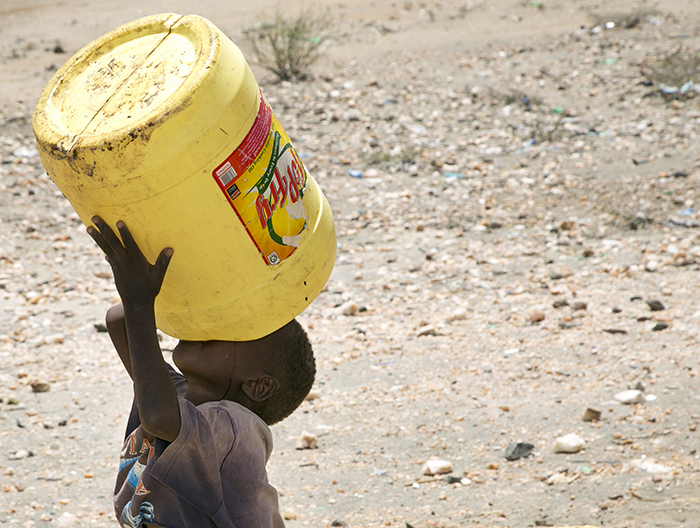 The work in Kenya’s driest areas is coordinated by the Millennium Water Alliance, a U.S.-based coalition. The goal is to increase water coverage in the arid and semi-arid areas from 37% to more than 50% by 2020. And private sector models and technologies are proving fundamental to the transformation. Among these is the use of remote sensors to monitor water sources. The solar-powered sensors relay data on the volume of water being pumped. In the event of a breakdown, technicians at Turkana County’s Lodwar Water and Sanitation Company, LOWASCO, can dispatch emergency teams to get the water flowing again, ideally in a matter of hours or days. “Before, there was no reporting system in place at all,” says Styvers Kathuni, head of water and sanitation programs for CRS Kenya. “Weeks and months would go by before a given borehole was fixed, because it depended entirely on someone making a phone call or physically traveling into Lodwar, the county seat, to report the breakdown to LOWASCO,” Kathuni says. “We just weren’t finding out about breakdowns,” he says, “because there’s almost no incentive to report them. No one gets paid to make the report, and that person might have to travel several days or use the little money he or she has to get into town. “So it was no one’s priority, because poor communities have a lot of other worries,” Kathuni says. The technology was developed by the University of Portland, Oregon, which helped launch the social enterprise startup SweetSense Inc., to commercialize the technology. Each sensor costs about $500 to produce but, over time, improvements in reporting will pay back the investment. Lauren Stover, senior program manager for SweetSense, based in Nairobi, says there have already been improvements in the system since 2016, when the first sensors were installed. 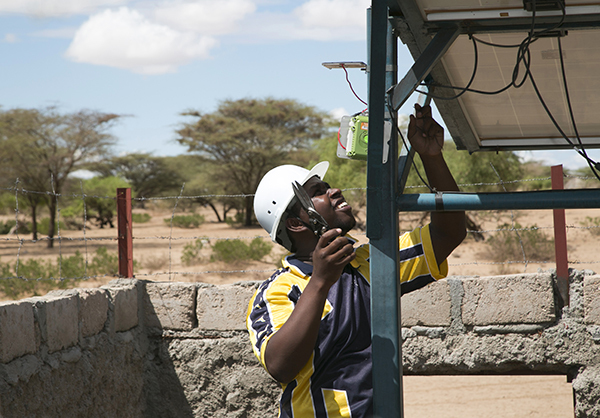 “In Turkana, we’ve already moved from relaying data over the mobile network to using satellite networks,” she says. “We discovered that, often, in the most remote areas, there is no mobile network. But satellites resolved that problem.” The added expense of using satellites is kept in check by limiting the number of reports in a day, as opposed to sending more frequent reports via text messages. CRS is also partnering with the Diocese of Lodwar to train and support LOWASCO’s water and sanitation work in Turkana County. LOWASCO employees can check boreholes remotely either from a desktop computer or from mobile phones, with an app that crunches the information into a system of charts and graphs that is easy to understand. The company’s repair crews—including diocesan teams supporting LOWASCO—can be dispatched to assess a problem when it pops up on their screens. At the end of each sensor installation, a technician relays the GPS coordinates to the main server, so that water points are slowly mapped out across the huge expanse of territory. Dozens of these sensors were added in April and May in the five counties. “The remote reporting system is already helping enormously during this severe drought period,” says Thomas Musyoki, CRS’ Kenya-RAPID program manager for Turkana County. “It rained a few days ago, but before that, it hadn’t rained in most parts of Turkana since April 2016. Breakdowns are happening more often, because these boreholes and pumps are being used so much,” he says. CRS, in addition to the Kenya-RAPID program, is supporting the Diocese of Lodwar in an emergency response that focuses on drilling new boreholes, rehabilitating others and repairing breakdowns. In addition, the diocese has been building water troughs and containment systems for livestock, which is important for the local and national economies. CRS’ emergency work in Turkana is supported by private donations.